How do you maximize your tapas intake while visiting Spain? A tapeo, of course! This fun activity essentialy is the Spanish version of a pub crawl or bar-hopping. And it’s a great way to see Madrid. Because we wanted to explore the city, on a recent visit we expanded our tapeo to include not only several tapas bars and restaurants, but also many neighborhoods. Here are some of the highlights of our experience. Since it was closest to our hotel, we made Melo’s our first stop of the evening. This Lavapiés eatery was recommended by a friend and is no hidden gem–it is well known for having the best and largest zapatillas in the city. For those who don’t know, a zapatilla is a toasted ham and cheese sandwich, but that pedestrian description does not do Melo’s sandwich any justice. These gooey monsters easily can feed three people. In fact, we are not quite certain how they qualify as tapas. They probably don’t. We were all revved up to eat more than a sandwich on our tapeo, so we ordered a half-portion. That left us some room for Melo’s other famous dish, croquetas. Throughout our mission, we learned that these are a fixture on pretty much every tapas menu, but word is that Melo’s are some of the best. As far as we’re concerned, breaded and deep fried béchamel and ham is always going to be good, so we have a hard time saying whether or not Melo’s are truly special. We resolved to do more research. 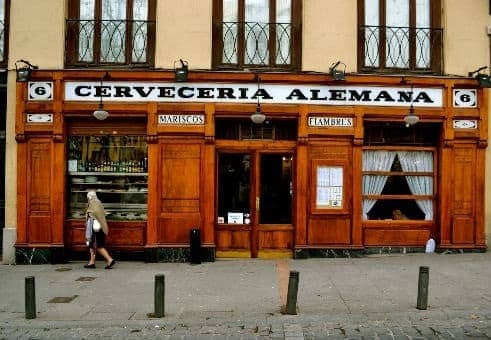 In trying to describe the vibe of Cervezeria Alemana, Kent said, “It feels like the kind of place Hemingway would have liked.” Well, it turns out it was. Subsequent research turned up that this place was such a favorite of Hemingway’s that he had his own table. Like Hemingway, we were pretty taken with this Plaza Santa Ana bar. I doubt, though, that Hemingway ever ordered something he thought was going to be uniquely Madrileño only to find out it was a hot dog, sauerkraut, and pickled pink fish. Unfortunately we did! Good thing we also ordered the delectable plate of Jamon Ibérico as well, or we would have to keep our visit to ourselves out of sheer embarrassment. We also ordered some croquetas after taking a cue from the restaurant’s matriarch, who shuffled over to the window and nabbed one to nibble on. Good enough for the owner, good enough for us. Viewfinder Tip: Plan your tapeo loosely; leave room for new friends and unexpected experiences. Wanting to make our way over to Chueca, Madrid’s bustling LGBT Mecca, we were especially excited to return to this bar since it holds some significance to us–it’s one of the places we visited on our first trip to Madrid. We had a quick glass of vermouth, which the taberna has on tap, and some green olives that, after much discussion, we decided were spiced with paprika. Don’t hold us to that though; at that point in the night, we already had sampled beer, sangria, and vermouth, so our ability to discern subtle flavors may have been impaired. Gastromaquia came very highly recommended. Despite this popular Chueca restaurant being a bit pricier than other stops we’d planned for our tapeo, we made reservations. This was going to be the splash-out-and-sit-down portion of the evening. Boy, were we ever bending the rules of a tapeo. We started the meal off with some patatas bravas, fried potatoes smothered in spicy mayo (chipotle in this uncommon variation). We have a habit of ordering Mexican food regardless of where we are in the world, so when we recognized guacamole on the menu, we seized on the opportunity despite the dish having no real basis in traditional Spanish cuisine. We then enjoyed a baked goat cheese salad with balsamic and honey, and pork skewers bursting with Moroccan spices. As if we already had not eaten enough, we topped the meal off with some chocolate mousse covered in salty little croutons. Delicious. With just enough room to make one more stop, but too much self-awareness to have any more to drink, we headed to our final destination, Choclatería San Ginés. This famous chocolate-and-churros shop is open 24 hours and makes the perfect nightcap. We ordered only a single portion–one cup of hot, thick, melted chocolate and six churros–which was more than enough after all the eating and imbibing we had done. What types of tapas would seek on your dream tapeo? Kent and Caanan are self-described fulfillment fanatics who rejiggered life so that every day could be a dream day. They started a virtual consulting business in order to travel deliriously, give back, and make a living from anywhere doing work they love. They most love writing about LGBT getaways, nature-centric adventures, the tech side of travel, globetrotting with purpose, and luxury escapes that aren't fussy.